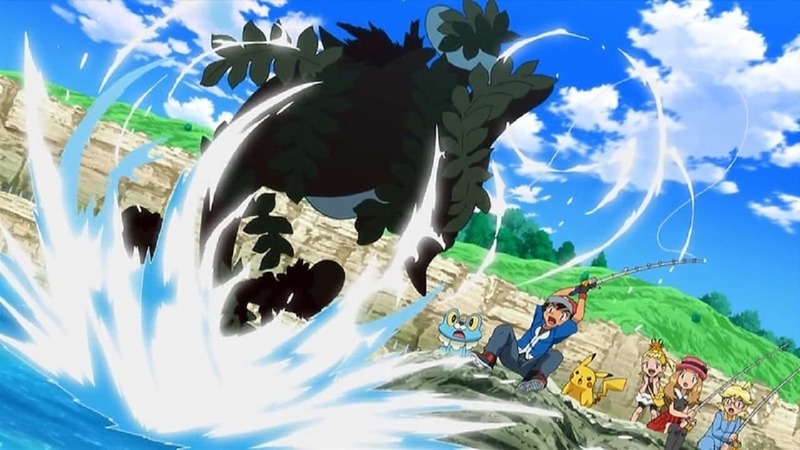 The episode begins with Ash and his friends taking an excursion to the Muraille Coast before heading out to the Cyllage City for Ash’s Gym battle with Grant. After lunch, Ash decides that they should work on their strategy for countering Grant’s Rock Tomb, and Pikachu, Froakie, and Fletchling are all ready to train. However, Serena decides that they should do some fishing since they’re at the beach and doing too much training will stress Ash out. Clemont then suggests that if Ash catches another Water-type Pokémon, he will have a much easier time when it comes to battling Grant, to which Ash agrees, so everyone begins fishing. Serena wonders what kind of Pokémon she’ll catch, while Ash already has a bite, but it proves to be quite strong as Ash struggles to pull it out of the water. Bonnie begins to wonder if it could be a Corsola, Clamperl, or even a Wailord, and Ash mentions that he will catch it no matter what Pokémon it is. The unknown Pokémon begins to go wild in the water, but is brought to the surface after one final pull from Ash. As Ash looks confused, Serena tells him it looks like he only caught some kelp, but Clemont corrects her, saying that Ash did in fact catch something. However, when Ash examines what he caught, it suddenly jumps to his face, flailing around. As Ash pulls the Pokémon from his face, he is confused and admits he didn’t know it was a Pokémon after all, but Bonnie notices that it is hurt and places a bandage on its head. As everyone stares at the Pokémon, it begins to flail about once more as it jumps from Ash’s grip and back into the water. Ash checks the Pokémon with his Pokédex and learns that it is a Skrelp. Skrelp then fires Sludge Bomb at them, thinking that the group is its enemy. Pikachu bravely attempts to talk to Skrelp to calm it down, but is hit with Toxic and becomes badly poisoned in the process. As Skrelp dives away underwater, Clemont tells them they need to get Pikachu to a Pokémon Center quickly, but as they rush off, a van pulls up at the side of the road and a couple offers them help in tending to Pikachu by using an Antidote. Having used the Antidote, Pikachu is successfully cured from the poison’s effects and is alright, much to Ash’s relief. Ash thanks the couple for their help and everyone introduces themselves to the couple. The couple then introduce themselves as Eddy and Lindsey, and reveal that they’re underwater archaeologists interested in searching for the Cussler, a luxury liner that sank due to hitting an iceberg many years ago. They reveal that the Cussler may be in the area of the Muraille Coast due to the current carrying it there. 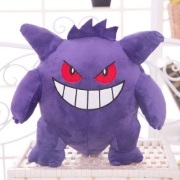 Becoming interested, Ash and his friends offer to help them in any way they can, to which they accept, admitting that they’re short handed at the moment. Lindsey mentions how the quest could get dangerous, so the group will need to listen to them and they agree as everyone sets off. However, once they drive off, Team Rocket is shown to have heard everything about the Cussler and how there are priceless treasures on the ship and decide to set their sights on retrieving the treasure for themselves. On the boat, Eddy informs Lindsey that it is almost time, and she tells Ash and his friends to watch the whirlpools very carefully. Upon watching them, the group notices that the whirlpools have now disappeared. This is because the intersecting currents that create the whirlpools regularly change, so the whirlpools won’t be around for a while. Eddy then lets everyone know they have reached their destination and that they are going to get ready to dive. Lindsey opens up the lid to the submarine and Ash asks her if this is what they’re going to be using to dive in, and after receiving confirmation, he asks if they can dive down with her. Lindsey is shocked and explains that the submarine isn’t very large, so it can only fit two other people in there with her. Clemont has a solution to the issue as he reveals his newest invention, a machine that will decide fair and square who wins a chance to go inside the submarine with Lindsey. The machine reveals the winner to be Ash and Serena, leaving Bonnie annoyed with Clemont for them losing, but Clemont tells her that their fate was chosen by science, so there aren’t any hard feelings. With the winning group now decided, it is time for them to leave for the underwater adventure to search for the Cussler. Clemont and Bonnie watch as the submarine disappears under the water and Lindsey asks Eddy if the communication between the submarine and the boat is clear, which Eddy confirms. Down in the submarine, Serena watches a group of Qwilfish swim by, while Ash mentions the amount of Octillery on his side. Serena is impressed by the amount of Water-type Pokémon there are as the submarine continues to go deeper into the ocean. Serena notices three Skrelp, and recognizes the one they encountered earlier by the bandage Bonnie put on its head. As Serena and Ash are happy that Skrelp managed to find its friends, the submarine is suddenly caught in and swept away by the current, which causes an interference with the communication system. However, Lindsey isn’t fazed by it but is instead excited that their theory about how the Cussler got swept away is proving to be correct. Serena becomes worried as the ship is quite close to them, but Lindsey handles things and gets them to safety. Ash notices the group of Skrelp following the sunken ship and Lindsey decides to follow them. The Dragalge begin to swim up to the light to investigate what is causing it as Eddy asks Lindsey what’s going on. Lindsey investigates the strange light. It is revealed that the light was caused by Team Rocket’s Magikarp submarine cutting through the side of the ship as Lindsey, Ash, and Serena arrive in their submarine, and upon arriving, Ash immediately recognizes the submarine as Team Rocket’s. The sudden mention of the name confuses Eddy as Clemont explains who they are and what they do. Clearly not aware of their presence, Team Rocket enter the ship through the hole they just made and are followed closely by the Dragalge, and shortly after, by Lindsey’s submarine. Once inside, Team Rocket begin searching for the treasure on the ship as the Skrelp and Dragalge emerge from the water, followed by Lindsey’s submarine. Ash opens the lid of the submarine, but there is no sign of Team Rocket. Serena also looks outside, but the Skrelp and Dragalge notice them and begin to fire Acid at them, until Pikachu steps in and is recognized by the Skrelp with the bandage, who tells its friends to stop attacking. Skrelp then goes after Team Rocket as they are busy setting up to steal the safe. An Acid attack is sent towards James’s feet as the Skrelp with the bandage shows itself to them, telling them to leave or they’re going to pay. Jessie corrects it, announcing that they’re going to get paid after they obtain the treasure. Ash, Serena, Lindsey, and the Skrelp and Dragalge arrive, and Lindsey asks what Team Rocket is doing here. Team Rocket reveal that they’re here to steal the sunken treasure. When Serena asks how they’re planning the get away with stealing the treasure, Jessie presses a button on a remote, revealing that the safe will blast off in mere moments. As smoke cloud fills the entire area, Team Rocket use this as cover to make their escape. As Team Rocket run, Skrelp takes off after them, and Ash sends out Froakie to follow Skrelp. Lindsey warns everyone that they need to get out immediately because once the safe opens up a hole, the entire area will become filled with water. The safe breaks through the wall of the ship, creating a hole and heading straight for Team Rocket’s submarine. However, as they prepare to grab the safe, Skrelp comes in view on the periscope, startling Jessie as the Skrelp attacks their submarine with Sludge Bomb. Froakie then looks into the periscope as Jessie tries to shake it off, but it holds on tight. Lindsey’s submarine emerges from the hole in the ship and Lindsey notices that the entire Cussler is beginning to become unbalanced due to it filling up with so much water, and that it will eventually collapse. Ash decides to help prevent it from collapsing and asks the Dragalge to help them out, who in turn ask the other Water Pokémon to help out, as well. Meanwhile, Froakie is captured and swung around rapidly before being thrown at Skrelp. Team Rocket obtain the safe of treasure and make their way to the surface, but are followed by Froakie and Skrelp. Back at the Cussler, the Dragalge and the other Water Pokémon try their best to prevent the Cussler from collapsing by holding it up. Ash then suggests that they use a metal plate to seal up the hole, and while holding it up over the hole, the Dragalge use Acid to attach it to the Cussler, which does the trick as the structure stops collapsing. Eddy mentions how everyone’s safety is what matters the most to him, and also reveals that the whirlpools will start to appear again soon. Team Rocket emerge from under the water with the safe still in their possession, but soon notice that the whirlpools have already began to appear around them, trapping them. Soon, their submarine is caught in one of the whirlpools, spinning them faster and faster until it blasts them off, causing them to drop the safe in the process. As Lindsey, Ash, and Serena come to the surface in their own submarine, Ash wonders where Skrelp and Froakie are as he looks off into the distance in the direction of the whirlpools, eventually noticing that they’re both trapped in one of them. Lindsey reveals that not even Water-types are able to withstand the whirlpools, and Ash tells Froakie to jump. Froakie then tells Skrelp to get on its back as Froakie uses its amazing jumping abilities to jump from object to object caught in the whirlpool. After successfully jumping, Froakie finishes off with one last big jump and is safely caught by Ash, and everyone is relieved that they are both alright.